"The Day Donald Trump Was Crowned King in Jerusalem"
"How Trump went from rebuffing top Jewish Republicans on U.S. embassy move to ‘King of Israel’", News analysis generously quotes op-ed by APN's Debra Shushan. "Experts wonder if move precludes possibility of deal," APN's Ori Nir quoted in article about the feasibility and desirability of a White House Israeli-Palestinian peace plan. "U.S. Jewish groups laud Trump's 'courageous' embassy move," News story on embassy inauguration generously quotes APN press release. "Israeli Annexation Of West Bank Would Violate International Law"
"My Zionism Is Fading, One Expulsion At A Time"
"Mahmoud Abbas’ remarks on the Holocaust explain why two-state solution is dying," APN among Jewish organizations criticizing Abbas for anti-Semitic comments. "German Palestinian group slams Abbas Holocaust speech," APN among Jewish groups condemning Palestinian President Abbas for anti-Semitic comments. "US Jewish Groups From Across Political Spectrum Blast Palestinian Leader Abbas Over Antisemitism," APN among groups condemning Abbas for anti-Semitic comments. "U.S. Officials and Jewish Groups Denounce Abbas' Speech, Accusing Him of anti-Semitism,"APN denounces Abbas' antisemitic statements; Tweets in English, Hebrew and Arabic. "U.S. Jewish groups hail Israeli intel after Iran nuke revelations," APN's statement on Netanyahu's speech re: Iran nukes quoted. "A pro-Israel leader mocked Natalie Portman as beautiful but not ‘too bright.’ Twitter wasn’t amused." APN's Debra Shushan quoted in story on Mort Klein's scandalous comment re: Portman. "Does Natalie Portman’s snub of Netanyahu make her the face of liberal Zionism?," APN's Debra Shushan and APN Board Member Mik Moore are quoted in a story on the Natalie Portman controversy. “The Insanity at the Gaza Fence,” APN mentioned (in hyperlink) as a resource by Roger Cohen in an op-ed. 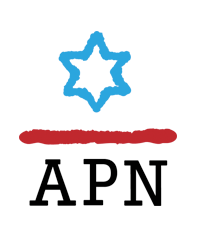 "Debunking the myth: White House envoy Jason Greenblatt is no moderate," Article on Jason Greenblatt mentions APN's campaign urging David Friedman's dismissal. "Palestinian journalist’s killing spurs international condemnation," APN's Ori Nir quoted in a story about the IDF's shooting of Palestinian journalists on the Gaza border. "Trump's Policies Towards the Palestinians Are Based on Bad Faith, Ineptitude and Cruelty"
"Presidents Conference ‘Transparency’ Questioned After Malcolm Hoenlein Revelations," APN among other member organizations of the Conference of Presidents that are concerned about Hoenlein's role on corporate boards. "US policy on the Middle East just got foggier," APN's Ori Nir comments on the Trump administration's lackluster performance in advancing Israeli-Palestinian peace. "As Trump and Netanyahu Meet, Our Plea as Interfaith Leaders: Stop Boosting the Proponents of a Religious War," APN's Debra Shushan co-authors interfaith op-ed: Stop Boosting the Proponents of a Religious War. "Who are the Zionists Against Israeli Settlements and the Occupation of the West Bank?," APN's Ori Nir quoted in story on "liberal Zionism." "What is the Pro-Israel Lobby and How is it Shaping US Foreign Policy on Iran?," APN's Debra Shushan quoted in story on American Jews' position re Iran.